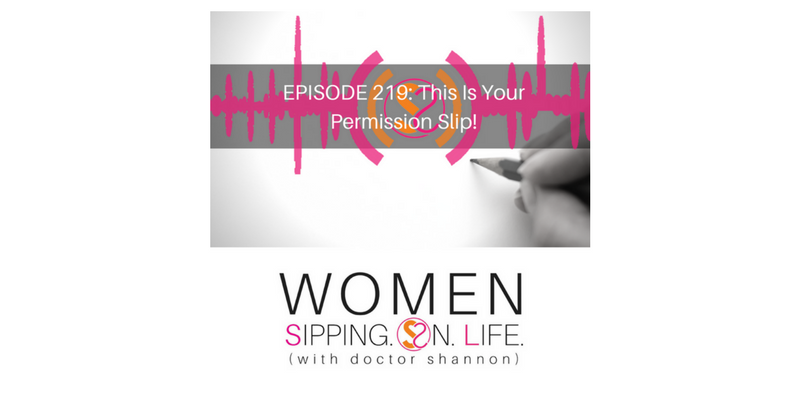 EPISODE 219: This Is Your Permission Slip! This is how you can take a stand for you and become your biggest advocate. Yes, this is your permission slip. Look at the word: Permission. What is the outcome that you’d like to see, or the result you’d like to create? Start with the mission at hand. In order for you to take a stand for yourself, you have to know what you’re standing for. If you don’t give yourself permission to stand for yourself, who will? If you don’t give yourself a permission SLIP, you’ll SLIP and fall on anything. Stand for something that matters to you. Take a stand for YOU, because YOU matter. 1. Being able to interpret your truth more than one way. Remember, if it can’t be interpreted at least two ways, it’s probably not true. Self care is the new health care. If you don’t take time to care for yourself, then you’re life isn’t cared for. We will care for that which we value. What would self care look like for you today? Sometimes that means taking a nap. Sometimes it means WAKING UP. Where in your life do you need to wake up right now? I stand and sip with you, my dear. So do your SIPPING ON LIFE SISTERS from around the globe. Yes, you have to do it for yourself. But you do NOT have to do it all by yourself. At the end of your statement, put a big ! — sign your name and date it. Then take a picture, and post it in the comments of the podcast on the WomenSippingOnLife.com website. Also please post our pic In the WOMEN SIPPING ON LIFE S.O.L. MOVEMENT FB GROUP as well.